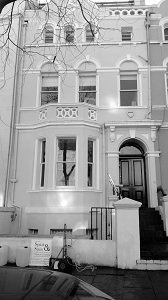 Today Spick & Span window cleaners went down to W11 to clean the windows of a large Victorian townhouse on behalf of a client that was due to move in to the property within the next two weeks. This imposing but very beautiful 4 storey Victorian building, set in Holland Park W11 had recently undergone building work and the windows were rather dirty as a result, which is why a window cleaner was needed there. Ordinarily the of windows of a building this height in W11 would’ve proved difficult to clean , especially if a window cleaner only uses ladders and traditional window cleaning methods, but Span & Span window cleaners are able to reach windows that are over 40ft. by using telescopic window cleaning poles with brushes, this method of window cleaning is ideal for very tall buildings such as those in the W11 postcode area. The window cleaning method involves pumping purified water to the brush head which the window cleaner scrubs the glass with and then rinses clean with water. Because the new owner of the property was not able to be present at the location at the time that the windows were cleaned it was prearranged that the work take place at the time that the general cleaner was home. The work took approximately 3 hours to complete, from start to finish, and all windows were cleaned outside only. Builders arrived before the work was complete and one of them noted how much better the windows appeared after cleaning. "Thanks so much for doing such an incredible job! Really happy with the results. I will definitely be using the services again."